Click the image above to zoom in. Thanks to everyone who has donated to the tarmac development at Páirc MacUílín so far. Way back in 1970 we asked our membership for donations to build a pitch at Benmore Park. Now 44 years later in 2014 we intended to tarmac a driveway and provide parking to our award winning facilities at Páirc MacUílín. We are asking that all adult members and supporters purchase a minimum of 1m2 of Tarmac at a cost of £20 and sell a minimum of one further 1m2 again at a cost of £20. In addition to adults we would also encourage All our juvenile members to purchase 1sqft at a cost of £5. Last chance to have your name included in the Tarmac donation. 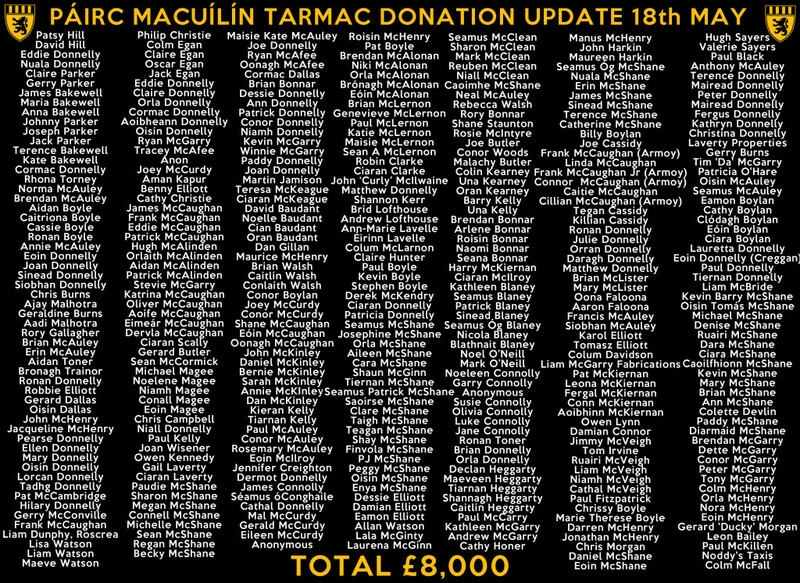 All those who have donated will have their name displayed both inside and outside the Clubrooms. Contact any Committee Member before 20th May 2015. Photos of the completed tarmac development can be seen here. Malachy McCurdy, Bernie McKinley, Dessie Donnelly, Gail Laverty, Joan Donnelly, Cathal Donnelly, Nuala McShane, Barry Kelly, Kevin McShane, Eoin Donnelly, James Connolly, Seamus McShane, Norma McAuley, Colm Davidson, Kieran Smyth, Anthony McAuley, Seamus Blaney Snr, Julian Laverty, Gerard McIlroy.